How Effective Are Helmets for Plagiocephaly? There has been some controversy in recent years regarding the treatment of deformational plagiocephaly (DP). Standard NHS advice is that it corrects itself given the correct conditions, but this notion is disputed by many Orthotists and paediatricians, who argue that this is not always the case. 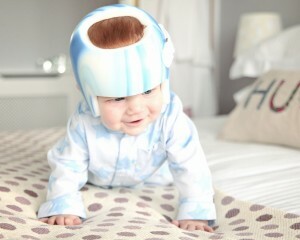 They maintain that, where the deformity is severe, a plagiocephaly helmet is sometimes required in order to correct it. But is there any evidence to back up this claim? Are there cases in which the condition fails to correct itself, and if so, how effective are helmets for plagiocephaly? First off, there is evidence to suggest that many infants develop plagiocephaly, and that most of these who are in the mild or moderate category have time in early infancy for this to self-correct. In 2010, Hutchison, Stewart and Mitchell of the University of Auckland conducted a follow-up study to assess the rate of improvement in head shape (amongst other factors) in infants previously affected by plagiocephaly. None of their 129 participants had undergone helmet treatment, yet by the time they reached three or four years of age, their head shapes returned to ‘normal’ in 61 percent of cases. But what of the other 39 percent? While most of these individuals showed a fair degree of improvement, 13 percent were described as displaying ‘poor improvement’, while 4 percent remained ‘severe’ at follow up. (Severity is assessed by the extent to which the baby’s head measurements deviate from the norm.) So while it may improve dramatically in the majority of cases, plagiocephaly does not always correct itself. This suggests that clinical intervention might be necessary for severe cases of plagiocephaly. Are helmets an effective treatment for severe plagiocephaly? Helmets are recognised amongst Orthotists as an effective treatment for babies with severe plagiocephaly, i.e. those in the top five percent ‘most severe’ in the population. But is there any evidence to substantiate this claim? In a study published in the Journal of Craniofacial Surgery (2009), a three dimensional surface scanning laser was used to measure the head shapes of 175 infants undergoing helmet treatment for plagiocephaly. They observed a marked improvement after four months, especially in those subjects that had been the most compliant with treatment. These findings were replicated in a Korean study published in the Archives of Plastic Surgery (2012), where the vast majority of their 108 helmet-wearing subjects achieved a significant correction. In addition, the greatest success rate was seen amongst those babies that started wearing a plagiocephaly helmet before the age of nine months (95 percent) and whose course of treatment averaged 7.83 months. These two studies and several others indicate that, given the correct conditions, plagiocephaly helmets can be a highly effective treatment. Provided a custom-made helmet is worn, parents comply with clinicians’ guidelines, begin treatment before nine months of age, and complete the full course of treatment, it is almost certain that a marked improvement will be seen. A recent report has been criticised heavily for failing to take such conditions into account. Published in the British Medical Journal, it concludes that plagiocephaly helmets make no difference to infants’ head shapes. Yet the treatment regimes used in the study were flawed, the subjects were given poorly fitting helmets and many dropped out midway through treatment. A recent response from the chair of the Craniofacial Society of the American Academy of Orthotists and Prosthetists, ‘Helmet Study Highlighted in The New York Times Is Flawed’, gives a comprehensive critique of the study. With such a poor research basis, it’s no wonder that no significant improvement was seen. You can read the original report and our own response for a better understanding. In the introduction to this post I briefly mentioned the standard NHS advice, which is that plagiocephaly will correct itself given the correct conditions. The conditions to which I refer relate to the practice of repositioning. This involves varying the position in which the baby rests the head, right from the first few days the baby is able to roll over, which relieves pressure on the affected area and helps correct the deformity. If this works, why bother with a helmet? Repositioning is proven to be effective for treating plagiocephaly in most cases, but once again, it might not be adequate where the deformity is severe. A study published in Pediatrics (2010) compared the success rate of plagiocephaly helmets with that of active repositioning, and found helmets to be statistically superior. Most Orthotists therefore advise parents to start repositioning their baby as soon as they notice a flat spot (usually at around eight weeks). If this does not give the improvement that they had hoped for by the time the baby reaches four or five months of age, a plagiocephaly helmet is often recommended. At this stage, the effectiveness of repositioning begins to decline as the bones in the skull harden and the infant starts to move about more independently.